But the television for Merino was also political, and brought together all socio-economic groups to laugh and observe experiences from their own lives diluted through a screen. Merino’s writing, however, is far from diluted. It is a rich cultural commentary on the importance of television in the 20th century and the writing itself is pungent with voice and imagery. Divided into three parts, Robert Merino’s essay will wash over you with memory and nostalgia. It will bring you back to quotidian moments of the past and have you contemplate those of the present. Its emphasis on the routine, the day-to-day images of life that we so often glaze over is welcome in the days of action and glory. With writing like this, thrill is unnecessary. Poachers, by Alessandro Cinquegrani, translated from Italian by Matilda Colarossi. Recommended by Nina Sparling, Assistant Blog Editor. There is much to love in the July 2016 issue of Asymptote THE DIVE, but the sounds around me stopped while reading Alessandro Cinquegrani’s “Poachers.” The words inflated to form a soundproof barrier of rhythms and tones. It was, in fact, rather like the sensation of a well-arched dive into the deep end of an empty pool. This is how I pick books—by their ability to blockade the white noise with the same satisfying whoosh of surrounding my body with water in one swift motion. Though an excerpt of a novel, “Poachers” at moments reads like an extended stream-of-consciousness prose poem. This is a text most of all about thinking. The narrator repeats over and over “I think,” an expression of uncertainty, desperation, and profound loneliness. The sentences are long—the repetition of the phrase gives the text structure, functioning almost as a form of punctuation. Translator Matilda Colarossi renders the text beautifully in English, capturing nuanced emotional textures with a natural and fluid tone. Cinquegrani makes reference to Marc Chagall’s haunting painting, The Promenade. Chagall depicts a man and woman walking through rolling hills, holding hands. But she floats above him, almost out of the frame, at a forty-five degree angle to the earth. Cinquegrani draws on a similar image-phrase throughout his work: “my cloud of raw expiation on a leash.” His wife suffers severe panic attacks that no doctor seems able to help. Her illness (and the tragedy that results) remains obscure yet casts an unavoidable shadow over the narrator. It is ever-present and impossible to grasp. The narrator follows train tracks, looking. 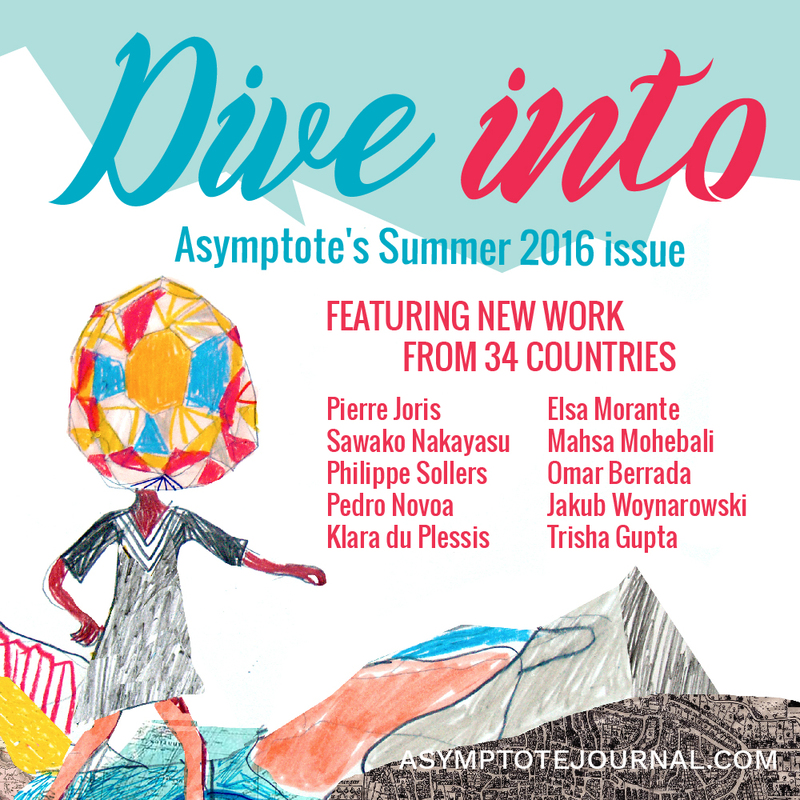 Dive into the Summer Issue of Asymptote here! Our January 2016 Issue is Live!